1 R IRISH secure Al Amara, Southern Iraq. 1 R IRISH Battlegroup moves into Iraq. 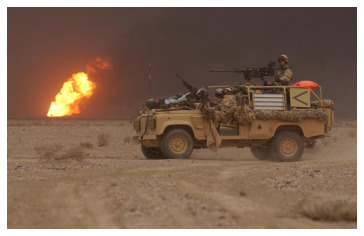 A patrol of 1 R IRISH Battle Group backlit by an oil well set on fire by Iraqi forces. The shamrock on the vehicle's side clearly identifies it as R IRISH. The vehicle, an un-armoured Landrover Wolf WMIK (Weapons Mounted Installation Kit) variant, is fitted with a .50in calibre heavy machine gun and a 7.62mm calibre general purpose machine gun. The 1st Battalion The Royal Irish Regiment (1 R IRISH) Battle Group, commanded by Lt Col T T C Collins, crossed the Iraq/Kuwait border as part of 16 Air Assault Brigade. Operation TELIC was the UK national operational name for the British involvement in the Coalition of Forces led by the United States on Operation IRAQI FREEDOM. 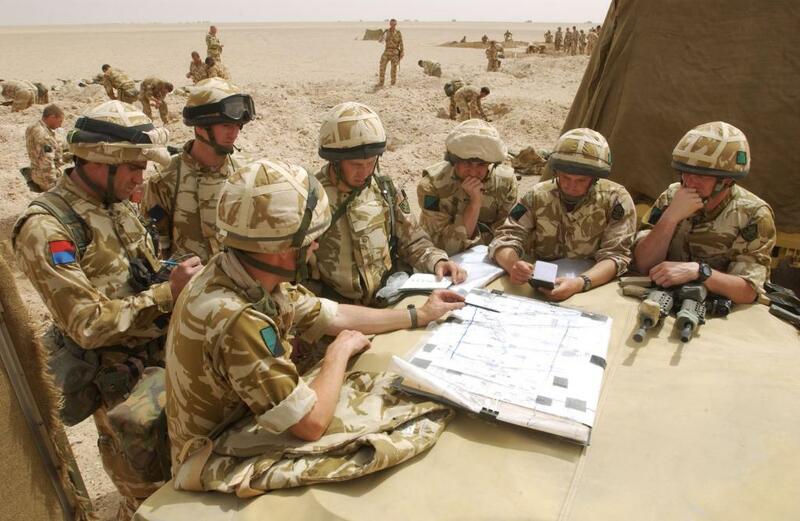 From mid-February 2003, 1 R IRISH deployed to Kuwait and established a temporary home at a tented encampment in the Kuwaiti desert, which the Battalion titled 'Fort Blair Mayne'. Acclimatisation and final preparations to fight began immediately and continued until the 1 R IRISH Battle Group moved to its final assembly areas. On 22 March, 1 R IRISH crossed the border and conducted a 'Relief in Place' with the 5th Regimental Combat Team, United States Marine Corps. The Battalion took over responsibility for securing the oil producing facilities in the Rumaylah oil fields and was also tasked with conducting counter-insurgency and humanitarian assistance operations in and around Al Rumaylah. As UK forces moved into Basrah, the area of responsibility stretched from the border with Kuwait to the Hammer Canal, an area in excess of some 2,000 square kilometres. When 1 R IRISH was relieved in the Al Rumaylah area, it moved north, crossing the Hammer Bridge to occupy the town of Al Medina straddling the River Euphrates. Once the crossing points over the river were secure, the advance continued to occupy Al Qurnah, the 'Garden of Eden'. 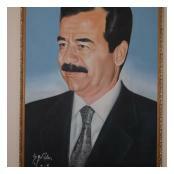 Within days, the Battalion was on the move again, advancing north to the capital of Maysan Province, Al Amarah. There, the Battalion established links with the local population and patrolled extensively to establish a Coalition presence to bring about a reduction in any looting and created the conditions for the restoration of public order and restoration of basic services. In late April, 1 R IRISH handed over Al Amarah to the 1st Battalion The Parachute Regiment and the return to Canterbury, England was completed by mid-May 2003. 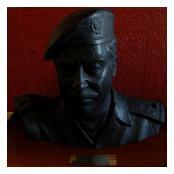 The Royal Irish Regiment was later awarded the distinction IRAQ.